I described a method for predicting muscle fiber type distribution from force-velocity (or power-velocity) data collected using an SRM. Unfortunately, as I have mentioned several times before other powermeters appear to be incapable of providing data with sufficient accuracy and/or temporal resolution to enable such calculations. For example, the original PowerTap recorded data only once every 1.26 s, which is generally insufficient for this sort of testing. Furthermore, data from a PowerTap are inherently "noisier" due to aliasing effects - that is, since the calculations are time- instead of event-based, each data point represents the average over a non-integer number of pedal revolutions, leading to values that tend to alternately high and low relative to the true value. Although more recent versions of the PowerTap can now record data at 1 s intervals (i.e., the current ANT+ standard), this aliasing problem still exists. Figure 1. Abnormal "spike" in power generated by Quarq CinQo when resuming pedaling after a brief pause. Figure 2. Quadrant analysis of the data file containing the abnormal power "spike" shown in Figure 1. As shown in this figure, a number of data points were recorded in which the average effective pedal force calculated from the power and cadence exceeded ~1500 N, with a maximum value of ~2500 N. Since the peak force on the pedals is usually about twice the average force, this would imply peak forces of ~3000 to ~5000 N, or approximately 4-7x my body mass. Given that I can only lift ~1x my body mass when performing two-legged squats, such values are clearly artifactual in nature. Figure 3. 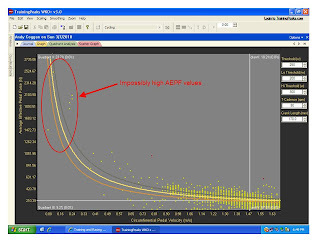 Non-linear AEPF-CPV relationship generated by Quarq CinQo during force-velocity testing. In theory it might be possible to avoid this issue by sampling the "raw" ANT+ data stream (which is broadcast at 4 Hz) and/or by judicious editing of the collected data. However, without access to additional equipment (in the first case) or more trustworthy data collected using another device (in the second case), such solutions seems to be markedly less-than-ideal. The above data were recorded using an iBike iAero as the ANT+ receiving device, so it is possible that they reflect limitations in how the data are handled by it rather than limitations in how the data are originally generated by the Quarq. It is difficult to envision, however, how this might be possible and still obtain close agreement between Quarq/iBike and, e.g., PowerTap data under less challenging conditions. Furthermore, I have recently been successful in using a Lemond Fitness Revolution trainer paired with their Power Pilot to generate linear force-velocity data that closely match that provided by an SRM, even though, like the iBike, the Power Pilot uses the ANT+ protocol to record data once per second. This suggests (although certainly does not prove) that the non-linear nature of the Quarq/iBike force-velocity curve reflects the behavior of the former, and not the latter. Given that powermeters other than the SRM appear incapable of generating robust force-velocity cuves, how can somebody who doesn't own one estimate their muscle fiber type? One possibility is to rely on some other fiber type-specific property of muscle, e.g., fatigue resistance. Figure 4. 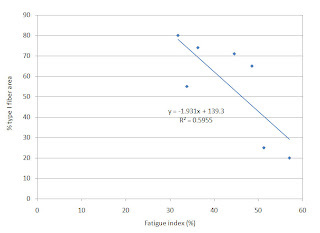 Relationship between muscle fiber type and fatigue index during a 30 s maximal effort. In some regards, the formula presented above - and indeed, this entire series of blog entries - can be considered to be "navel gazing" of limited practical value. After all, when racing a bicycle it is the actual power you can produce over relevant durations (along with, e.g., tactics) that determine the outcome of a race, not your muscle fiber type per se. Furthermore, I strongly believe that "if it walks (sprints) like a duck (slow-twitcher) and talks (resists fatigue) like a duck (slow-twitcher), then it is a duck (slow-twitcher)", regardless of what a muscle biopsy might reveal or what formal tests/predictions I have described might suggest. Nonetheless, I do think that being able to "pin a single number on things" may help at least some people understand their own physiology just a little bit better, with this deeper insight hopefully helping them prepare better for/perform better in competition. 1. Coggan AR, Costill DL. Biological and technological variability of three anaerobic ergometer tests. Int J Sports Med 1984; 5:142-145.